20cm x 20cm filter pads made for 20x20 plate filters. Pads rated 0.45 micron remove 99.999% of bacteria. 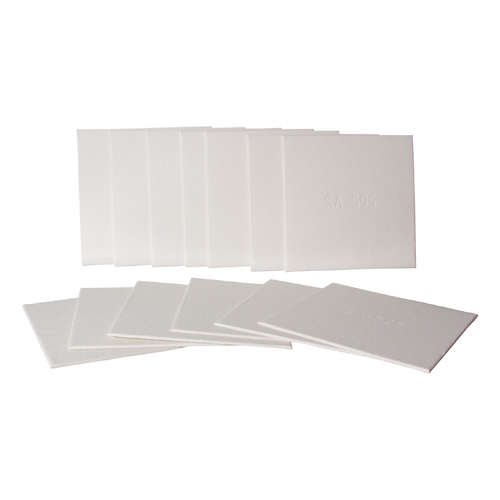 This pad is the right choice when you want to promote sterility in the bottle, although do please note that the pad does not remove 100% of bacteria - only a cartridge filter can do so. To absolute filter dry white wine. With these 0.45 micron filter sheets can i skip using Sorbate on a sweet wine? These types of filters are "Nominal" and not "Absolute". This means that it will get rid of most stuff at 0.45 or less, but is not guaranteed. So this will clean up very nicely, but if you want to make sure no yeast get through you must use a mechanical type filter instead of a paper. In general, after filtering with this, you would then use a canister type filter to "absolute" filter to 0.45 microns. In a word, no. Pad filter ratings are based on the average size particle that can pass, not the absolute size. If you want to skip sir are you could filter to .45, then run it through a cartridge filter with a .45 membrane cartridge. Those are specced based on max size particle. The short answer is no. A .45 filter sheet will still allows particulates of up to a 1 micron rating to pass through the filter. Although be it very few, it does happen. The only way to truly filter out all of the yeast is using a .45 absolute filter. Thanks for taking your time to reply much appreciated! No, plate filtration is never a “sterile” filtration. Only membrane filters @ .45 micron can deliver a sterile filtration, provided your bottling line has also been carefully sterilized. Better keep using the potassium sorbate. got it thank so much! One can only omit the sorbate if the filter and the downstream equipment (hoses, bottler) are sterilized. Also, keep in mind that a .45 sheet is nominally .45, we have a .45 Screen after the plate filter. No, you would still need to use sorbate as the filters are not 100%. You would need to use a cartridge PES filter with the correct micron porosities to be 100%. Ok thanks so much for the info! You can but you are taking a huge risk. Sorbate amounts are PH determined so find yourself an online calculator that will tell you the minimum you need. No. All sweet wines need sorbate plus minimum 45ppm free sulphur. These filters absolutely do the trick when filtering wine.